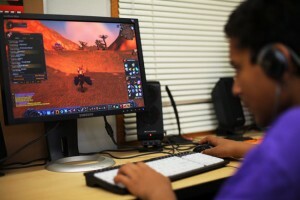 World of Warcraft: Online Education? Video games are a touchy subject when it comes to their benefits to kids, vs. their many negative side effects. However, not all video games are made the same. 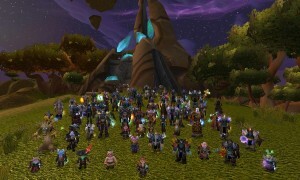 It’s important to consider the different aspects that different games bring to the table, and a very good example of a game that involves everything from reading literature, to social interaction and cooperation, and even to some mental scientific processes and calculations, is World of Warcraft, the massively popular MMORPG (Massively Multiplayer Online Roleplaying Game). The game, which has been around in a developing form since 2004, with a story that began in 1994, is set primarily in the world of “Azeroth.” It is home not only to the fictional residents, but also to over 11 million subscribers worldwide, as of 2008. That’s a bigger population than most U.S. cities. In a game that requires social interaction and a community investment, players are required to spend more time on the characters they create and play as in the world. For example, there is some content in the game that simply cannot be done alone with a single character’s toolkit. Instead, players must team up to take down the harder bosses within the game. For example, somebody who designs their character around being a “tank” would be the one holding the focus of the enemy and protecting their allies, including basic damage dealers that may sometimes put out more damage than they can take (thus, the benefit of having a tank), while someone designated as a “healer” would make sure the tank, or anyone else, doesn’t die. Additionally, each player in the encounter must sometimes follow mechanics such as avoiding “area of effect”, or “AoE,” damage, while also remaining in the line of sight of the healer in order to be saved from going to low on health. This sort of coordination must be done either by studying the fights yourself and applying the tactics, or by listening to and cooperating with a “raid leader” telling you what to do. Furthermore, as players become more experienced themselves, they’re able to pass on what they know to newer players. This sort of practice in leadership is also beneficial. Aside from social benefits, studies that analyzed official World of Warcraft forum posts showed 85% of players demonstrating scientific literacy within the posts, evidenced by the interactions and discussions around endgame content. This included the use of statistics and hypotheses to make points about strategies and game mechanics. Many of these mechanics also get younger children thinking mathematically, as described by Jill Palmer, a mother who spends time with her kids playing games like World of Warcraft. In her example, she explains how her son Luke pondered the question of what would happen if a character in the game in a disease cloud could infect other characters. In other words, if a character walked into a room and infected four other characters, how quickly would the disease spread as each of those four characters infected characters that they encountered? It’s this kind of problem solving that is really not too far off from what scientists are doing in the real world, says Constance Steinkuehler, an educational researcher. Plus, video games in general can be beneficial to us as well, as the results of another study consisting of 33 laparoscopic surgeons show that the surgeons who played video games performed their advanced procedures 27% faster than those who didn’t, and made 37% fewer errors. Additionally, more research using the WoW forums showed that, within the discussions, 86% of people utilized the community to share information in order to help figure out in-game problems, and 58% of them demonstrated the use of systematic and evaluative processes. Not only that, but World of Warcraft‘s expansive quest text and item names also contain advanced use of vocabulary that can help in school. Even if you don’t know exactly what a word means, you can make a fairly educated guess based on where you remember seeing the word. For me, off the top of my head, I remember knowing words from vocab units in high school English classes thanks to World of Warcraft, including words like malevolent, vindicator, maelstrom, and feint, among many other words. As long as it’s regulated, gameplay and communication like that in World of Warcraft proves to be beneficial in many ways. Though, there are dangers to spending too much time in Azeroth, but it’s fair to say that many beneficial things become hazardous when done too much, with little other activity outside of the fact. That being said, when played a healthy amount in addition to regular exercise and other activities, the social and academic benefits to World of Warcraft can be a real “game changer” for some students that need the extra interactivity to focus and succeed. Can ‘World of Warcraft’ Make You Smarter? This entry was posted in Uncategorized on October 21, 2016 by Brian Cunningham. Being an avid gamer myself (anything Playstation 4), I am glad you wrote on this topic. Although I have never played World of Warcraft due to the monthly subscription fees that inhibited my 8th grade self to induldge in the world of Azeroth, I agree with many of the potential educational benefits learned from playing the World of Warcraft. MMORPG are often times very complex and require the gaming users to think “outside of the box” in order to overcome final bosses but I would have liked to seen more of a evaluation on the overbearing time commitment these kinds of games often have on individuals, especially those of a young age. Before when I played excessively, I recall myself spending 4 hours a day on games like League of Legends which would only increase on Friday and Saturdays. Finally I really liked the part where you added in the end of your blog of how many beneficial things can become hazardous when done without moderation. All in all, great post!